I'm showing some pieces this Saturday 21st in Manifesto Festival Toronto. 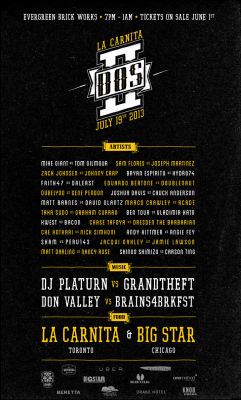 Manifesto is really cool festival celebrating youth culture with live music, art, fashion, dance etc. I'm so pleased to be in such amazing festival to celebrate and push forward our culture. Come by to 918 Bathurst if you have a chance to be in Toronto this weekend. 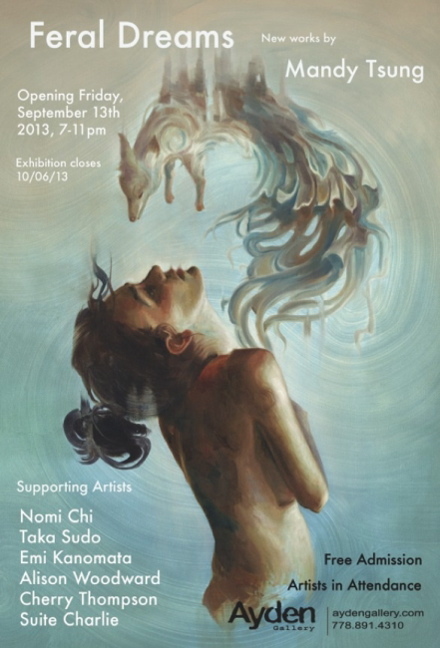 Mandy Tsung and I are opening the show on Friday September 13th at Ayden Gallery Vancouver. We are showing lots of new works. Come by to the opening party to see our new works and to have some drinks! I'm showing 5 new works in the group show "DOS" which is opening in Toronto Canada on July 19th. 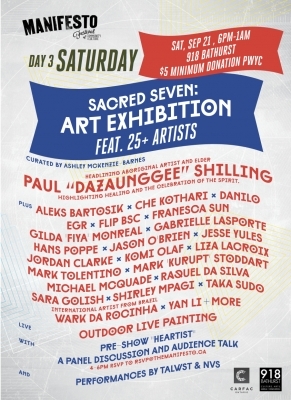 "DOS" is the 2nd annual event of art, music and food. 40 amazing international artists were paired up in two's, and pairs worked on the same chosen them. I'm so pleased and honored I could collaborate on the theme with really great artist Graham Curran. This will be this year's biggest art show in Canada. Don't miss out if you are in Toronto. 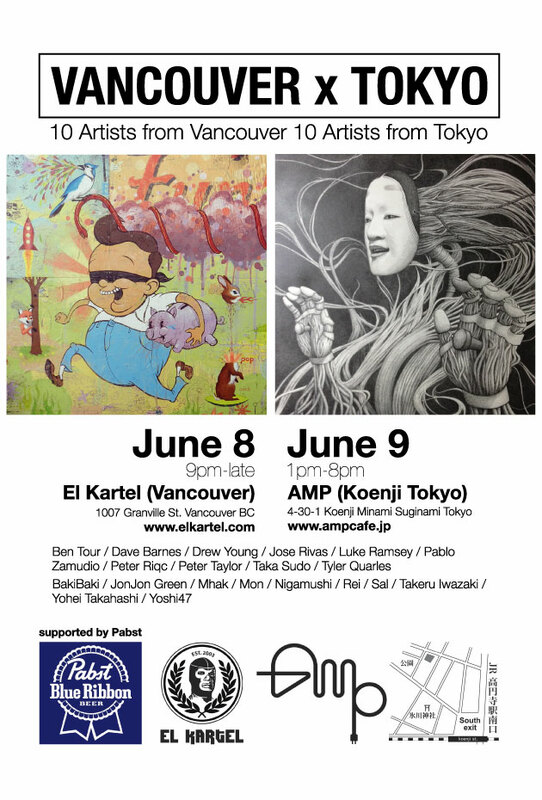 Art Show which is showcasing 10 artists from Vancouver and 10 artists from Tokyo. 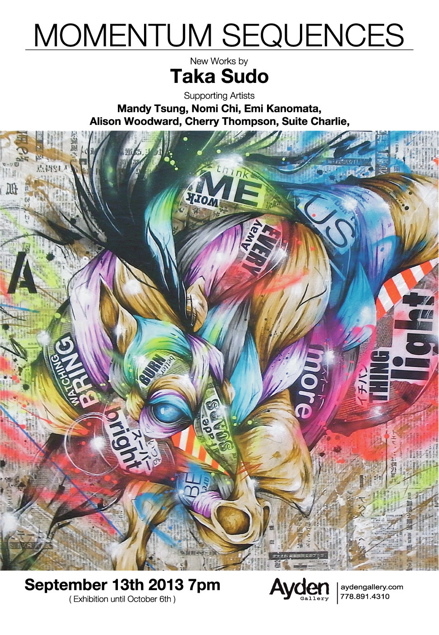 Each artists creates 2 pieces of artworks on 24"x24" panels, one piece is exhibited in Vancouver and another in Tokyo. Each show venue, El Kartel (Vancouver) and AMP (Tokyo), opens shows at the same time to celebrate great culture each other. "Vancouver x Tokyo" is the art show which tries to manifesto creativity can go beyond any borders easily and people can meet, inspire each other and understand each other anywhere through great creativity and great culture. Opening at El Kartel on Saturday June 8th 9pm-late. Opening at AMP on Sunday June 9th 1pm-8pm. This will be great show and super fun night! Come by El Kartel if you're around Vancouver!! "STROKE ART FAIR", Urban Art Fair opening this week in Munich Germany. My works will be exhibited at C.A.V.E. Gallery's booth. I'm so pleased and excited about showing my works with amazing C.A.V.E. Gallery in such cool art fair.